"R" and I have really been enjoying cooking at home more since we remodeled the kitchen. We have so much more counter space, dishes are easily thrown in the dishwasher (how did we live without one for so long???!! ), and I am in love with our new kitchen table. When I'm not assisting, I like to curl up at the table and watch him cook as we chat about our day. Dinner was always important in our household growing up. We'd gather around the kitchen table to catch up, linger after dinner, and often bust out a board game. Sure, my brother and I both went through time periods when we were bratty and annoyed by this "family time" and wanted to be holed up in our rooms instead, but we knew that it was important and something that my parents expected of us. I am so glad that they did. I have such great memories of sitting around our table, and I enjoy every minute of it when "R" and I visit my family now. Dinner was meant to be slowly enjoyed, lively conversation taking place, and memories made. It's something that I try to bring to our dinnertime now, often insisting that we set the kitchen table, sit down for our meal, and slow down while we eat to really talk to each other. "R" clearly has a different perception of what dinnertime is, but he indulges me as best he can, and we do enjoy this time together. Sometimes I give in and we eat over the coffee table as we watch TV. Compromise, people. Heinen's believes that dinner time is important too, and they are hosting a campaign called "Heinen's Sunday Supper" to learn about what supper means to you. I think Sundays are the day when families often set aside time to make a nice meal and linger at the table together. As part of this campaign, Heinen's asked me to participate by sharing with you what Sunday Supper means to me, and they provided me with a gift card to shop for a meal to enjoy. "R" and I had a blast shopping there last weekend, browsing the seafood department, picking up some of their easy prepared foods to eat during the week, and purchasing a small wedge of fantastic cheese to enjoy for dessert on Sunday. I wanted this Sunday Supper to be special. To enjoy cooking the meal together, and feasting on some of our favorite foods. 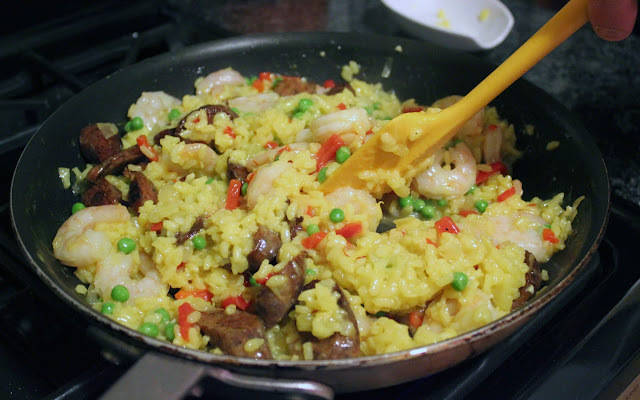 That meant that it had to include shellfish, and we found a fun recipe in Cuisine at Home that we adapted. Saute fennel, leek, garlic, and herbs de Provence in oil in a large pot over high heat until fennel begins to brown, 5 minutes. Combine wine, orange juice, and saffron (crumble threads between your fingers so they dissolve easy) in a bowl. Deglaze pot with mixture, and stir in tomatoes. Layer potatoes in basket, cover, reduce heat to medium, and steam 15 minutes. Add clams, cover, and steam 15 minutes. Top clams with kielbasa, shrimp, and corn; cover and steam until clams open and shrimp are opaque and shells are pink, 5-10 minutes more. To serve, divide broth among four shallow bowls, then divide potatoes, clams, kielbasa, shrimp, and corn among each serving. What a gorgeous plate of food! It tasted as good as it looks, and it was a great way to enjoy a classic fall clambake at home. I was impressed with the flavor of the corn and clams, since they are not in-season. That is one thing that I love about Heinen's- the quality of their products. So, what does Sunday Supper mean to you? Disclosure: I was asked to participate in the Heinen's Sunday Supper campaign, and received a gift card in exchange for this blog post and tagging photos taken. It was such a fun experience, and a great reminder about how important dinner time together is to me. Spring is officially here! The 50 degree weather in Cleveland today actually helps us feel like this statement is true. With warmer temperatures starting, sunshine peeking through the clouds, and promises of longer days, that means that event season picks up in our city. Everyone is ready to get out and about! April- Table 45: The restaurant is offering a fun special just in time for April Fools’ Day. The mixologists are introducing a new novelty to guests called the “miracle berry” which plays a tongue trick; the berry actually changes the way flavors taste! After tasting the miracle berry, flavors that are normally sour will taste sweet. Cocktails include: Meyer Lemon Martini, Vanilla Citrus Martini, and Tangerine Martini. One berry per guest. April 5th- Culinary Vegetable Institute: Earth to Table Dinner. Featuring Chef Ryan McCaskey from Acadia in Chicago. 8 courses. $85 per person plus tax and service fee (gratuity is not included). Reservations are required. Please call 419.499.7500 or click here for more information or to reserve your table. April 8th- Pier W: Wine Dinner- Wines of Spain. 6:00PM. $75 per person, not including tax and tip. Includes four courses with wine pairings. Reservations required, contact 216-228-2250. Register by April 11th by emailing slangal@cff.org, calling 216-475-CURE or online. Any great April events that I missed? Please share in the comments! Disclosure: I was asked to promote each of these events. I will be receiving two tickets to the Earth to Table, Wine Dinner, and Chef's Fantasy Dinner. I would not promote these events if I did not want to share them with you. All opinions are 100% my own. Tomorrow, March 26th, is Brown Bag Day for the annual Harvest for Hunger Campaign to support the Greater Cleveland Food Bank. Pack your lunch tomorrow, and donate what you would have spent dining out to the Campaign. For every $1 donated to Harvest for Hunger, the Food Bank can provide enough food for four meals in a local hunger center. 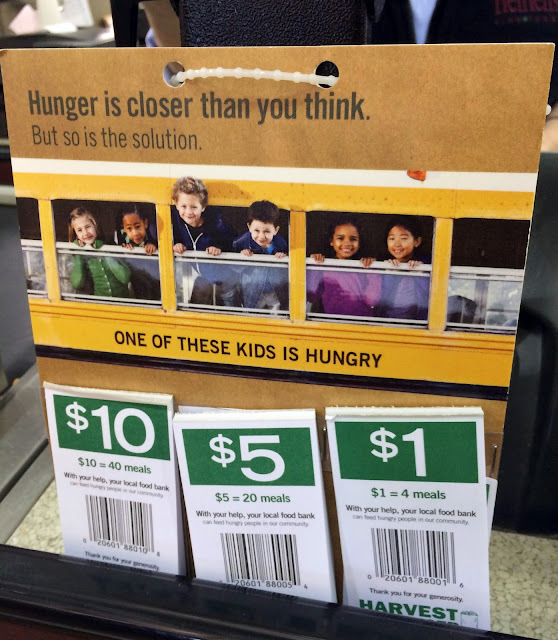 That $10 lunch that you would have bought on Wednesday could feed 40 people a meal in Northeast Ohio. Your dollar really does go a long way with this organization, so let's show our support of their annual fundraising campaign by packing lunch tomorrow. You can make a donation online here. It's as easy as adding a coupon to your check-out process. So, pack up your lunch at home tomorrow for Brown Bag Day, and donate what you would have spent. Hunger is closer than you think, so be part of the solution in our community. Disclosure: I am a former employee of the Greater Cleveland Food Bank. I am a former YP Pantry Council member. 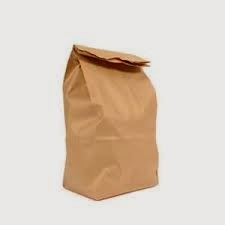 I was not asked to blog about Brown Bag Day. I simply believe in the organization's mission, and wish to support their annual fundraising campaign. "R" and I spent a lot of time in the Akron area this weekend, without really meaning to. I am a busy person. My work and personal life keep me out many nights of the week. I work from home. So, when I have an entire week of no evening commitments, and I'm in the house all week, I tend to get a little stir-crazy by Friday. This past week was a prime example. By the time "R" got home from work on Friday, I was literally bouncing off of the walls, and begging him to hurry and get ready so that we could go somewhere. To do something, anything. We decided to head towards Akron to do some exploring. Our first destination was Quaker Square, but that turned out to be lame. So, then we needed a dinner plan. I looked to Twitter, and my tweeps did not disappoint. A flurry of suggestions came in, and we headed to the Diamond Grille. But, more on that later this week. This blog post is about dessert. We were craving something sweet after dinner, but couldn't think of anything in the area (or on the way home) that wasn't ice cream. I happened to see a big billboard as we driving for the Dessert Bar. They were closed, but it peaked my interest. On Sunday, we also found ourselves in the Akron area. I was on the hunt for a patterned armchair for our sunroom. I've struck out everywhere that we've looked in Cleveland (and now Akron). Any suggestions? Anyway, we ate a big brunch, so we weren't really hungry for lunch later in the afternoon. Something sweet sounded great though! Wouldn't you know it, but we drove right by the same billboard again. It prompted me to Google Dessert Bar, and it was just minutes away. 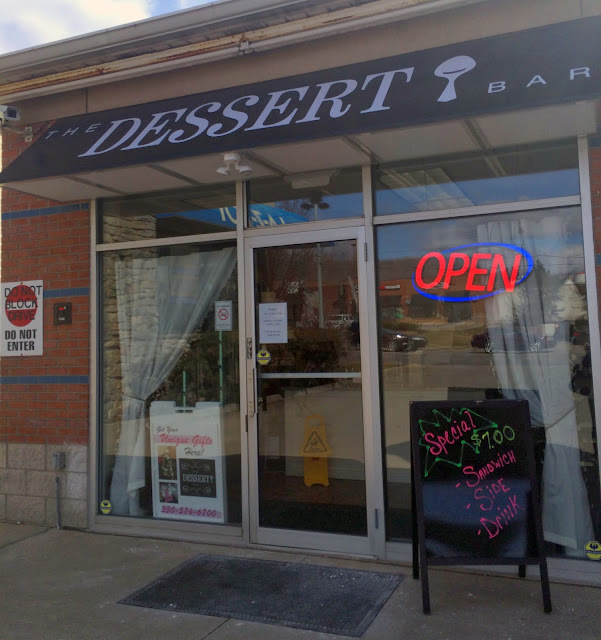 This small little bakery/cafe is connected to a Circle K in Fairlawn. Do you know what this means? I finally got to try Lawson's chip dip, and cross one item off of my Cleveland Bucket List! Dessert Bar was pretty picked over by Sunday afternoon, but they still had plenty of cupcake choices, two types of brownies, and a few other pastries/cakes. "R" tried the Turtle Cupcake. The frosting was piled high, very dense, and too sugary-sweet for my taste. However, the chocolate cake itself was moist and quite good. I went for the Chocolate Chocolate Brownie with chocolate chunks in the brownie. Again, very dense and gooey, and not too chocolately. It hit the spot. They also have a lunch menu of salads, sandwiches, and sides. Catering is also available from Dessert Bar. It was a fun little find, and that billboard was sure worth the investment! It caught our attention twice. They've only been there a couple of months, so hopefully the marketing dollars will pay off and they'll do well. Check them out. Look, sometimes dinner isn't planned out, or you need to whip a meal together in a pinch. I only talk about the fabulous meals out, events attended, and good recipes that "R" and I try. It may appear that that is our "everyday," but that's certainly not the case. Sometimes, meals are thrown together with what we have on hand, or we're trying to eat as "cheap" as possible that week so that we can splurge on something else. These meals typically involve products that are easy to use, have a shelf-life, and can be pulled out to help put food in our bellies. I turn down most pitches for sponsored product or brands that aren't local, independently-owned businesses. But, when Minute Rice contacted me, I decided to take them up on the offer. Rice, and sometimes products in their line, become a go-to when we need a quick meal on the fly. It's a great base for piling on vegetables, a protein, and one of the sauces that we keep on hand. So, I decided to sample the products that they offered to send me. I was a little overwhelmed with the number of rice products that they sent. To be fair, we haven't tried all of them yet. The Ready-to-Serve products disappeared quickly, becoming a quick lunch or snack for "R" most of the time. Tip- The Black Beans and Rice contain the two separately, you heat, and then mix. On its own, "R" didn't care for the bland flavor of the Multi-Grain Medley. With a bit of butter, the flavor of the rice popped, and he has since bought several other packages of it. Another cupboard staple that I like to have on-hand is the Kitchens of India pouches. They can be heavy on the salt, so be careful with portion sizes. However, the three kinds that I've tried are pretty tasty and so quick and easy to heat up! The Palak Paneer is pictured above (first time trying it, and it was a little blander than others), but the Pav Bhaji (mashed vegetable curry) is my favorite. You can heat and eat as-is with these pouches, but we like to add vegetables and sometimes a protein. Between Minute Rice and the three minutes that the Kitchens of India sauce needs to heat, we had a meal within minutes on a busy evening. Sometimes, that's just life. This was a peek into the un-glamorous side of our cooking at home. What's your go-to quick and easy meal to make at home when there isn't a dinner plan or a lot of food in the fridge to choose from? Disclosure: I was contacted by Minute Rice to review their products. I was provided with the rice products pictured above. I was not asked to blog about it. All opinions stated are 100% my own. I don't do many product reviews for the blog, but when Orlando Baking Co. contacted me to see if I would be interested in sampling their True Grains products, I decided to take them up on the offer. Orlando Baking Co. is celebrating 140 years in business, and have been a local Cleveland business since 1904 when part of the family moved over from Italy. They are truly community-oriented, and give back to Cleveland in many ways. I've had several of their products over the years, and they put out some great bread! They sent me three varieties of their True Grains 100% Whole Grain Bread. First, their Seed'licious, which is America's First Probiotic Bread. It is textured with flax seed, sunflower seeds, chai seeds, and millet. It is made with probiotic cultures that promote digestive health, and is a good source of Omega 3. Now, you may be thinking "How could that taste good?" But, it does! This was our favorite bread of the three. It disappeared pretty quickly in our house. One day, I enjoyed a veggie and mozzarella sandwich on it. It held up well, and kept my sandwich in tact. Next, we had the Purple Wheat Raisin Bread, with the same nutrients as blueberries. It is a low-fat bread with a sweet, nutty taste, and rich nutrients give it a slight purple color. It contains anthocyanins. This antioxidant is being studied for its efficiency in fighting cancer, heart disease, and age-related conditions in the brain. All I know is that it tasted so good! This bread made for a great breakfast treat. The last bread that they sent to me was the Honey Grain. It contains 24 mg of DHA Omega 3 per serving, and Omega 3 promotes cardiovascular health. This bread ended up being our least favorite of the three. It didn't have a unique flavor like the other two, and I've had better-tasting honey wheat bread before. All three of the breads were dense and hearty, in a good way. They held up well, no matter what we were using them for. I did notice that they started to mold faster than other breads we've had in the house. But, that just means that it's better for you. So many bread products out there use harmful chemicals to extend shelf-life. I just hated throwing away bread that had started to turn. Orlando's products can be found throughout the Midwest, with a lengthy list of stores in Ohio posted on their website. Some big name stores in Cleveland are Giant Eagle, Heinen's, Dave's Supermarkets, Marc's, and even BJ's and Sam's Clubs. Have you tried any of their True Grains breads? 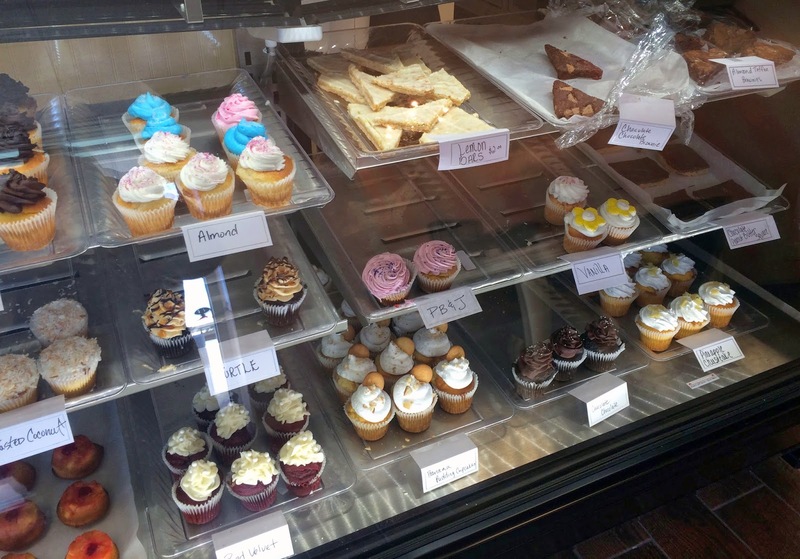 What is your favorite Orlando Baking Co. product? Disclosure: I was provided with three loaves of bread as samples in exchange for this post. All opinions posted are 100% my own. Thank you to Orlando Baking Co. for the opportunity to sample the product and share my thoughts with my readers. I'm a sucker for a good risotto, and they are often screwed up. The texture can be hard to nail perfectly. So, we've only attempted it once at home. 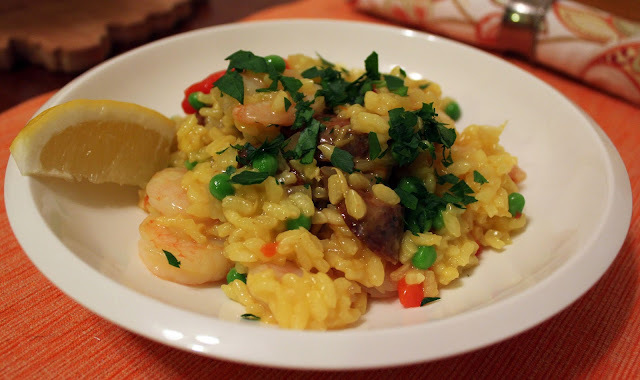 When "R" and I saw a recipe for Paella Risotto in the recent April 2014 issue of Cuisine at Home Magazine, it was time to try it at home again. Simmer broth, wine, bay leaf, salt, zest, and saffron in a saucepan over medium heat until fragrant, 5 minutes, discard bay leaf. Cook chorizo in a large skillet over medium-low heat on both sides until crisp; transfer to a paper-towel-lined plate. Discard drippings and wipe out skillet. Heat oil in same skillet over medium. Add onions and garlic and cook until onions soften, 3 minutes. 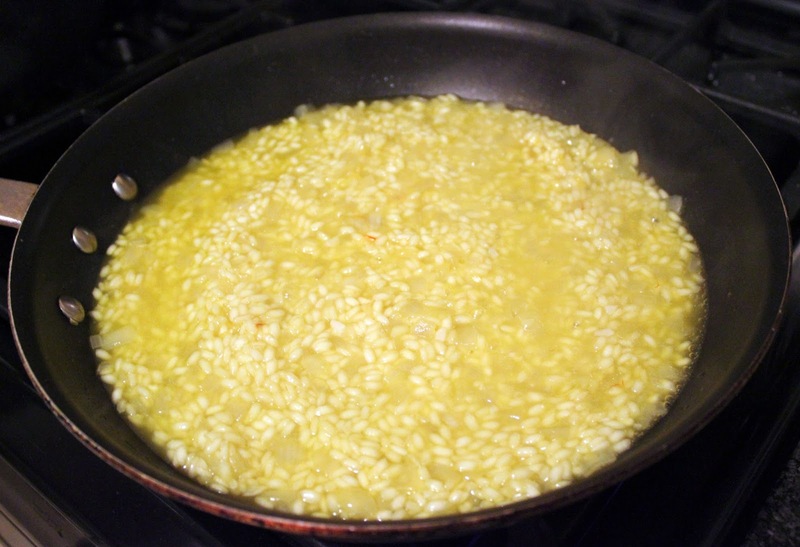 Add rice and stir with a wooden spoon to coat with oil, 1 minute. Add 1/2 cup broth, stirring until liquid is absorbed. Continue adding broth in 1/2 cup increments, stirring constantly, until each addition is absorbed before adding the next, 35-45 minutes total. Stir in shrimp and cook until opaque, 2-3 minutes. Stir in pimentos, peas, and chorizo. Garnish each serving with parsley, and serve. We also squeezed a bit of fresh lemon juice over top of the risotto once plated. The texture was creamy, and the flavors of chicken broth and lemon really stood out. Personally, I would have preferred a bit more heat. The chorizo was very spicy on its own, but got a little lost once added in. We'd "doctor" it a little to fit our taste next time, but overall I enjoyed it and it made for some great leftovers the next day too. 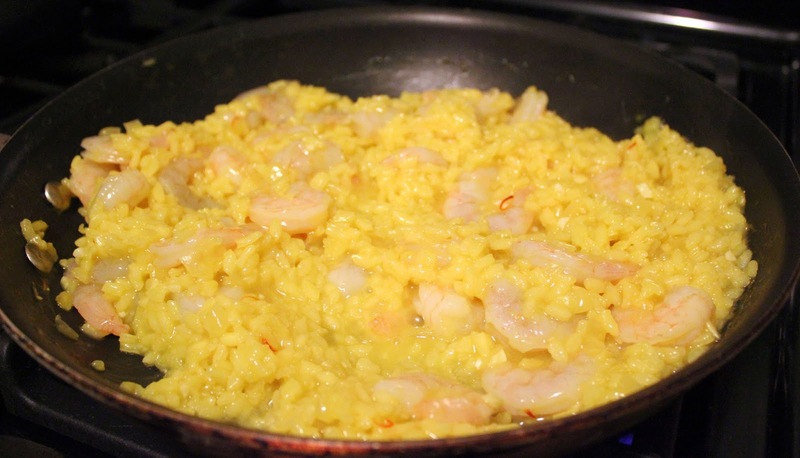 Risotto can be time-consuming and tricky to get the texture just right. Have you tried it at home before? 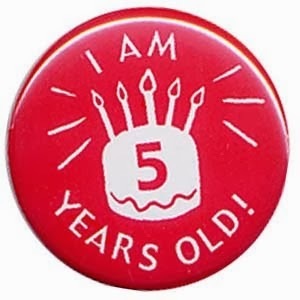 Today this little old blog turns five. FIVE. 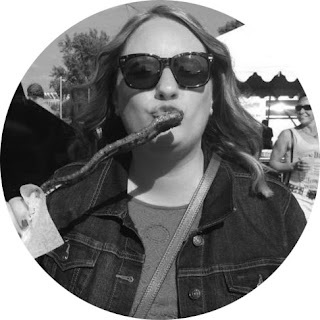 Happy Blogiversary to me! Where did the time go? Well, at least I have a published record of where it went, but it sure did fly by. I'm still enjoying the ride, so I'll keep on blogging. Thank you for being with me along the way! People typically celebrate with cake, ice cream, cookies, and other sweet treats. So, I'll share one with you today. I'm a dummy. I had no idea that Malley's Chocolates had ice cream parlors in some of their locations (four to be exact). I've stated over and over that sweets aren't really my thing, but shame on me for missing this one. One of these old-fashioned parlors is located in Lakewood, and they have late-night hours for a perfect after-dinner treat. Out with friends last weekend, we stopped by around 9PM for sundaes. I was still full from dinner at the Buckeye Beer Engine, but that didn't stop me from stealing bites of "R's" brownie sundae. That thing was massive, and decadently delicious. The best part about the Malley's Ice Cream Parlors? 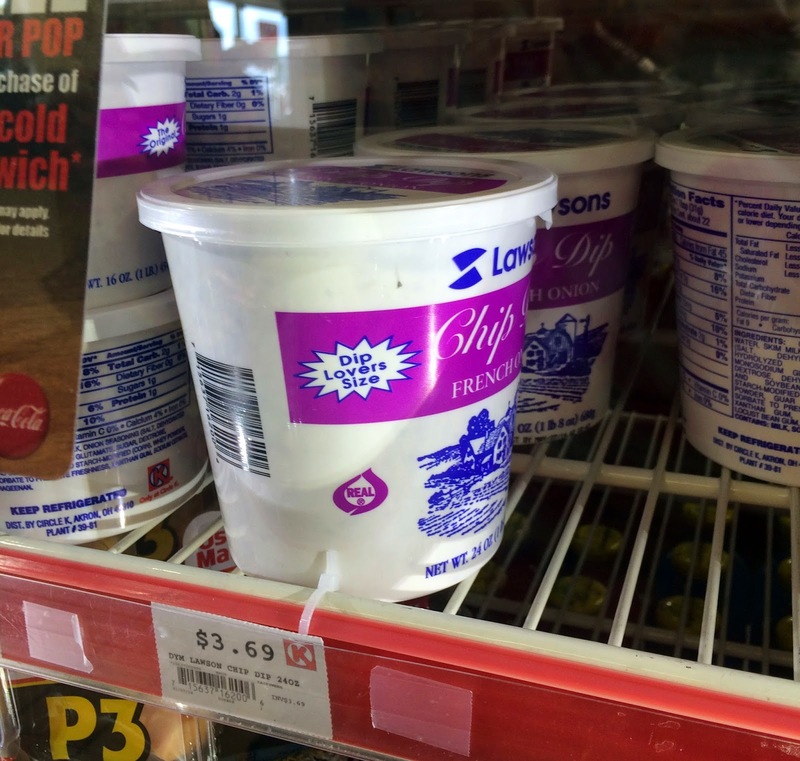 If you order a sundae or hot fudge for your ice cream, you receive your own cup of hot fudge to pour as you wish. Not only does that add to the "fun" factor, it ensures that you can still enjoy fudge until the last bite. It was such a great discovery! Have you ever been? They are also in Bay Village, Mentor, and North Olmsted. Our first stop in tackling the restaurants on my 2014 To Dine Challenge list was actually Dolce Wraps. We stopped at the Fairview Park location for lunch. This local chain has three locations- Fairview Park, Avon, and North Royalton. It's quick, easy, and quite tasty Mediterranean food. Ordering takes place at a counter, and if you're dining in then they will bring your food to your table once it's ready. I had picked up some tips through Twitter on what to order, and I wasn't steered wrong! ...and an order of the Falafel ($2.25 for four). We also ordered the Sauce Sampler ($3.35). We didn't really eat the pita chips that came with the sauces, but this sampler is worth ordering every time. The sauces were great with the food, and we had fun trying all of them. You get to pick four out of six. Our favorite was the Aglio (garlic) and Apricot Chipotle Pepper sauces. The Spinach Pie was okay, but not memorable. Topped with the Aglio sauce, and suddenly it was delicious! I would slather that sauce on almost anything. The Falafel were fine, but again, nothing special. I've had much better. I ordered the Steak Curry Wrap with rice, Salata (special blend of tomatoes, onions, lemon, olive oil, herbs, and spices), and their spicy Mango Curry sauce ($5.95). Simply put, it was delicious and I really enjoyed it. I played around with some of the other sauces, and was full after only half of the wrap. I took the other half home, with the rest of our falafel, and it re-heated fine the next day. Dolce Wraps was quick, easy, very good, and you can find cheap and healthy items here. Dining Deals Alert! I wish that there was a location closer to us! I'd be there more often. What: For nearly 85 years, Shaker Square has been at the heart of a lively and diverse neighborhood with something for everyone. The upcoming “Shake the Square” celebrates 85 years of global cuisine at Shaker Square! Five local restaurants including Balaton, EDWINS, Fire, Sasa and Zanzibar will offer a special 3-course dinner menu for $33. Other Shaker Square merchants will offer special discounts and promotions. What Else: Walk the square and find 33% off select items at Dewey’s (coffee, popcorn & ice cream), Fashions by Fowler and Christopher Amira Salon & Spa. Receive a free popcorn at Shaker Square Cinemas when you present a receipt from any of the restaurants below. No one entered the ticket giveaway for the Cleveland Home + Remodeling Show for next weekend. If you want two tickets, contact me. They're yours. It was nearing the end of February, and I realized that I hadn't been to any of the 2014 To Dine Challenge restaurants yet. Yikes! I think by the end of March last year, I had completed four or five. "R" and I had to hop to it. Now, I've been to two. Also, Phat Daddy's Kitchen has moved out of their rented kitchen, with no plans announced for re-opening. What to do? Should I vote in a replacement? I'm destined to never completed my To Dine Challenge. Ugh. A snowy night and a last-minute evening errand to run on the east side last week brought us to one of the Challenge restaurants- Petti's Pizza & Ristorante in Wickliffe. We were on a single mission for this restaurant- Try the Pizzaburger ($5.75). An ooey-gooey heart attack on a plate. A sausage patty sandwiched in between two slices of homemade pizza. It tasted just like you would imagine it should. My only complaint? More seasoning in the sausage patty or pizza sauce would make this sandwich stand out for its flavor, and not just the novelty of it. I knew what was ahead, so I had loaded up on their Spinach Salad ($6.65) first. It was more of a platter than a plate, but it did the trick and filled me up. I only ate half of the pizzaburger, and took the other half home for some delicious leftovers the next day. They have several salad options, including a build-your-own. Nothing special about the salad contents or dressings, but at least there's a healthy option to build a meal around. The restaurant is very kitschy, with plenty of classic-Italian red, checkers, and some fake plants and plastic tablecloths thrown in. Our server was very friendly and attentive, and the food arrived quickly. There is a large parking lot connected to the restaurant, so finding a close spot as the snow fell was easy. If the sheet pizza slices in the pizzaburger were any indication of what their homemade pizzas are like, I bet that they are fantastic. I'd like to try one. Several of the entrees and specials that night sounded appealing as well. But, we were there on a mission, and...Mission Accomplished. The first Cleveland Home + Remodeling Expo, presented by Carrier, is coming to the brand new Convention Center in Downtown Cleveland March 14th - 16th. If you're planning a spring renovation project, like we are, it's a great opportunity to speak with experts, check out products, and be inspired to tackle home remodeling or design projects. Check out the list of celebrity and expert appearances throughout the three-day show. Personally, I'd love to hear about some behind-the-scenes moments from Extreme Makeover: Home Edition's Ty Pennington. That show was a special thing between my grandmother and I. We'd watch it every week, and email each other with comments. A former employer's product was also featured in some of the home designs, and it was fun to try and catch a glimpse of the products that I marketed daily for them. "R" and I are about to tackle remodeling our back sunroom. The floor has some water damage, thanks to poor construction of the addition, so we're going to have to gut it this spring. I'm looking for design inspiration, and flooring options. I'd like to make the room more functional, and utilize the small space well. Tickets for the show are $10 each, or $8 if you purchase them online in advance. You can also save an additional $1 online by using the code "BiteBuff" at checkout. That means that you could attend the show for just $7! Or, you could win two admission passes here. Just leave me a comment below, telling me what home design or remodel project you're tackling next. I will select a winner, using random.org, on Thursday, March 6th. Good luck! Disclosure: I was provided four passes to the show, two for myself in exchange for this blog post and two to give away. The ticket winner is limited to winning only one giveaway hosted by local bloggers. All opinions stated are 100% my own.